...they think of... the Twin Oaks. I didn't know that until I moved here - in fact I knew nothing about Sharon except that it had an Audubon center. (Which is probably something else people think of!) But on our first visit, our host drove us up to the peak of the hill on Route 41 to view the famous vista. This shot (which is featured in my show - see yesterday's post!) is from a different angle - you have to hike up into the field to see them this way. What else is Sharon best known for? There are probably many answers to that - anyone want to nominate something (or someONE) else? A tree for a place, what a nice symbol! Great shot, as usual. This photo is so beautiful! What a wonderful landscape! I ask myself what it is about trees. They are so photogenic most of the time, don't you agree? That is a wonderful shot - a classic. Yah, great shot. As for what Sharon is best known for, it's not terribly glamorous and photoworthy, but I'm afraid Sharon is best known for its hospital. Have you shot it before? that blue sky is flawless. What a great shot. There's something so peaceful about these trees in winter. One of the best tree photos I've seen. The snow and blue sky really set it off. A perfect tree & I appreciate the light dust of snow too. I only know Sharon through your blog and I do remember some of your other photos of these (or other) oaks. That is a gorgeous photo! You are lucky to have such natural beauty there. I echo Edwin and Sally. This shot is literally breathtaking. Kudos! As I was about to click on your blog I thought to myself what is Sharon known for. . . Well, I only know Saron because of your images, and what came to my mind as a repeating theme was the oaks, so hooray. I'm in insider now, I guess ;^). Gorgeous photo! Happy Theme Day from Maui! I love your photo! It's perfect. it really is amazing! 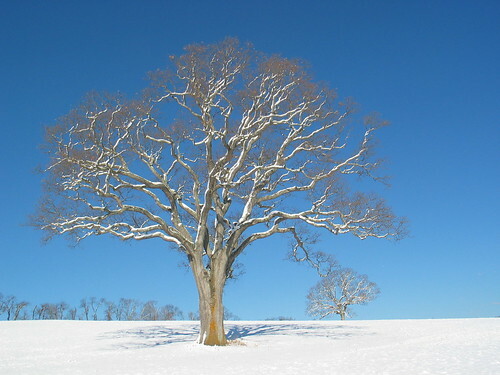 the sky is so blue, and against the snowy landscape and the tree is just beautiful.. i wish we'd get some snow! Just a fantastic image! Love it! This is a spectacular shot....love the tree! It's very clean image of your place. Nice! How's your show going? I really wish I could get there to see it. I love the snow on the branches in your photo.